(CN) – Fears over how climate change will manifest itself in the United States typically center on coastal areas, where predictions of a rising sea prompt predictions about disappearing beaches from Los Angeles to Miami to the Jersey Shore. But two recent studies make the case that the American West and its precarious water supply represents the true canary in the coal mine when it comes to the disaster of climate change. The first study explores the diminishing flows of the Colorado River and what it means for the 40 million people who rely on the formerly abundant water source. 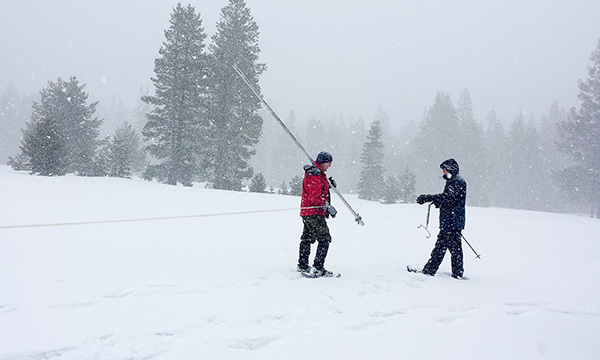 The second looks at snowpack trends in the mountains of the American West and concludes that recent declines throughout the region are due to rising temperatures and not consistent with historical fluctuations. From 2000 through 2014, the flows of the Colorado River have declined by 20 percent when compared to the historical average, study authors Bradley Udall, a scientist at Colorado State University, and Jonathan Overpeck, a scientist at the University of Arizona, say. “This paper is the first to show the large role that warming temperatures are playing in reducing the flows of the Colorado River,” Overpeck said. Anywhere from 1/6 to 1/2 of the reduction is a direct result of rising temperatures due to the collection of greenhouse gases in the atmosphere, the study estimates. It results in a loss of about 2.9 million acre-feet of water per year, enough water to fill Lake Tahoe four times. Beyond the ecological implications, the impact to humans is severe: one acre-foot of water is enough to supply a family of four for an entire year. Spanning, 1,450 miles, the Colorado River supplies drinking water to seven states and the Mexican states of Sonora and Baja California. The Colorado River Basin has been in a drought since 2000, but the study says flows will only diminish as greenhouse gas emissions increase the temperature. River flows, measured in cubic feet per second, will diminish by as much as 30 percent in the next 30 years and by as much as 50 percent by the end of the century, according to the study. Most of the water that flows toward the Sea of Cortez originates in the river’s upper basin, fed by the Rocky Mountains in Colorado, Wyoming, Utah and New Mexico – where temperatures have risen by an average of 1.6 degrees Fahrenheit compared to the historical average. Here is where the first study intersects with the second, in which researchers say rising temperatures in the region have reduced snowpack totals. The region’s primary supply of water comes from melting snowpacks in the Rocky, Sierra and Cascade mountains during the winter. Melting snow supplies two-thirds of the West’s water. According to the study by Canadian researchers, the western United States lost between 10 and 20 percent of its water supply in 1980 through 2000 due to climate change. The study attempts to not only show the loss, but quantitatively demonstrates that the loss can’t be attributed to natural fluctuations in precipitation, solar events or volcanoes. “Here we show that this loss is consistent with results from a large ensemble of climate simulations forced with natural and anthropogenic changes, but is inconsistent with simulations forced by natural changes alone,” the authors write. Furthermore, the study says the phenomenon will worsen. The snowpack in the West will be reduced by 60 percent in the next 30 years if temperatures continue to rise, the authors say. While concentrating on two disparate elements, the conclusion is the same: Climate change is shrinking the West’s precious water supply.